Why are Fridays so fantastic? I think the idea of date night, plus 2 days off makes me feel like I just won the lotto! 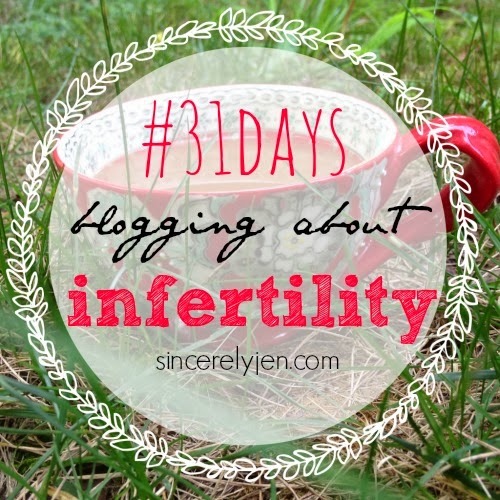 I have been pretty open about my infertility walk for the last 2 years. That first year it was something I thought we would deal with quickly so I didn't think we needed to share our struggle. Fast forward 3+ years and I realize it would be impossible for me to keep this struggle bottled up. It gets hard to not share our infertility journey when people ask about kids. If you try and say "no, not yet, hopefully soon" people somehow think that is an open invitation to say "oh, you are young. you have plenty of time" or "well be sure to enjoy this time because there is no going back". Sometimes I just nod my head and move on to the next topic, but when people get pushy with their advice I then share a tiny bit of my infertility story. This usually leaves them shocked and unsure what to say. They usually back track a bit and apologize for asking and then I assure them it is ok, and that I openly talk about my infertility. When I go to blog conferences the topic comes up rather quickly in a conversation with a person I've just met. They usually ask what I blog about and I say "life, clothes, our military adventures and my struggle with infertility". When I shared this with a women while at BlogHer back in July I got a response that left me speechless. We shared what we blogged about and I said my line from above. We continued to talk and she began to tell me about a new blog she was going to start. Long story short she compared the pain of dealing with infertility to the pain a mom feels when she sends her kid off to summer camp. I stood their dumbfounded. I had no idea what to say. I think I nodded my head, smiled, took a sip of my cocktail and began to quickly think of a way to excuse myself before I laid into her about how she should NEVER EVER use that comparison again. I soon found a way to excuse myself and quickly told my friends I was with and then texted some girlfriends of the crazy encounter. I needed a bit of assurance that I wasn't being crazy and overly sensitive. To be honest, the comment didn't bother me as much as it would have a year ago. I think I was more shocked than anything. But the reality is people say things like this all the time to women struggling with infertility, women who are very vulnerable. The woman I had this lovely encounter with seemed to be someone who doesn't think before she speaks. She probably has no idea why or how what she said would upset someone struggling with infertility. Women who struggle with infertility and share their story don't expect everyone to understand or know what to say, we know it is hard topic to talk about. We live and breathe the journey so we know. What we do expect is for people to have compassion and not take our struggle as a joke and make it seem insignificant.